Where Do Stinkbugs come from? Repair or replace damaged screens on windows or doors. If stink bugs have already entered a home, use a vacuum cleaner for their removal and dispose of the bag immediately to prevent odor from permeating the area. If an infestation develops, a licensed pest professional should be contacted to evaluate and assess the severity problem. As the experts have said, Stinkbugs do not pose a threat to humans and properties but their massive number can be a nuisance and once you step on them, you’ll spend the rest of the day putting off that nasty smell. 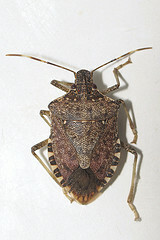 Stinkbugs however can be prevented from entering homes and properties. If there’s a BMSB or Stinkbug infestation in your area, please contact All Pest Exterminating Inc. to assess the problem and provide immediate and effective solution.